I really love my guinea pig farming experiment. Today, it is the once monthly sort, in which young males get moved to the male cage (they have fertility after 3 weeks! ), the females over 1.3 lbs get moved to the breeding pen, and the males over 1.3 lbs get processed. Today, I put five males in freezer camp. All between 1.3 and 1.8 lbs. 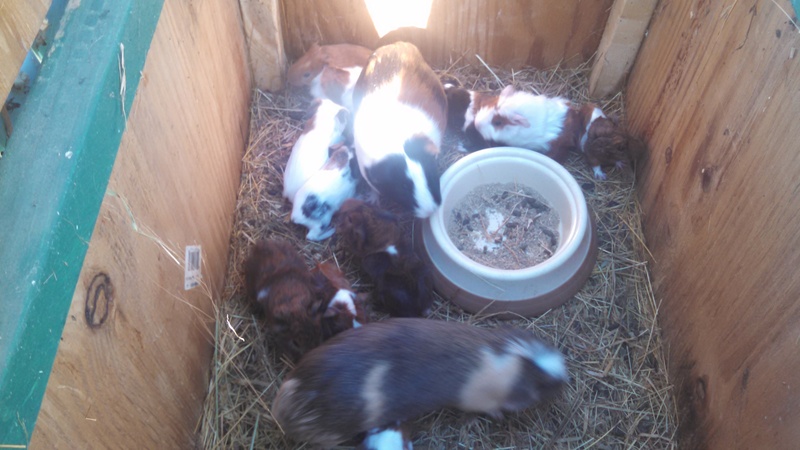 I have 35 females total, 22 of breeding age, and 13 in the grow out pen (from age of 3 weeks to 1.3 lbs). Three females graduated from the grow out pen, to the breeding pen today: Cocoa (Charcoals daughter), Krinkle, and Lisa. There are 3 males that are breeding, Fluffy, Ron, and Tan. There are 8 males in the growout cage, most born in late September. 14 babies are less than three weeks old, and unsexed. Right now, this brings the total of guinea pigs up to 57.